But increasingly, selecting an alternative to Hg is chiefly a matter of choosing among one of the three sensor types used in digital thermometry: platinum resistance (PRT), thermistor, and thermocouple. They differ substantially in performance under various conditions, and identifying the best technology will depend on the nature of the intended measurement task. In general, users will need to make choices based on several criteria for both the probe and the method of read-out and display. Necessary range of uncertainty at a given temperature. Standards organizations such as ASTM International and the International Electrotechnical Commission (IEC) group instruments into classes based on maximum allowed tolerances for various ranges of temperatures. (Tolerance is defined as the maximum difference between the thermometer reading and the true temperature.) For example, a PRT in ASTM's "Class A" has a tolerance of 0.13 °C and 0.05 Ω at 0 °C, but those numbers rise to 0.98 °C and 0.33 Ω at 500 °C. Uncertainty is an apparently similar but quite different metric. It is defined as the statistically likely range of measurement relative to the true temperature. 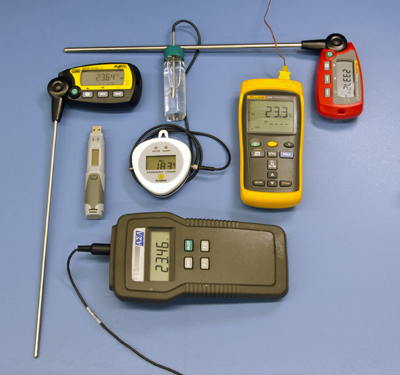 Internationally recognized standards organizations publish figures for specified resistance-temperature relationships (among other variables) which are used to calibrate resistance thermometers, and other standards for thermocouples. But ultimately, total uncertainty will be affected by numerous factors including calibration error, temperature range, mechanical vibration, electronics, and thermal environment. NIST offers numerous resources on the subject of thermometer calibration. Click here for information on calibrating PRTs. What is being measured – air or liquid? Different probes will be required for each medium. Temperature range of use: Each digital technology has a characteristic range. Thermistors span a range from -50 °C to 100 °C. 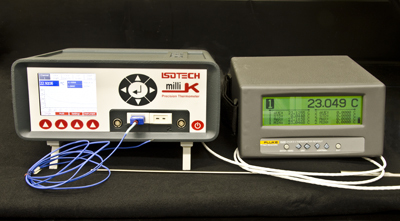 Thermocouples or PRTs can handle measurements from -200 °C to 500 °C, and thermocouples are typically used above 500 °C. Mechanical shock – how likely is it? For example, PRT film sensors have small size, good response time and high shock resistance. Wire-wound sensors with slightly constrained coils have much better accuracy (approaching ±0.01 °C over a 400 °C span), but are sensitive to shock. Performance is highly variable with model. Nature of the environment – explosive? high moisture? extreme ambient conditions? Probe style – air, penetration, standard, surface? – and dimensions. Number of probes to be connected to the read-out and allowable cable length. A relatively inexpensive digital display format is available for each kind of sensor. Knowing these properties will allow users to more accurately match a digital unit to the application previously served by an Hg thermometer. Type of numerical display required? Number of probe readings to be displayed? Handheld or benchtop display needed? Features such as min/max display or alarms? Additional considerations, such as the need for unique probe coefficients, resolution, and ice melting-point correction? Display resolution and required accuracy? More sophisticated thermometer electronics and displays may be appropriate, depending upon application. The overviews of PRTs, thermistors, and thermocouples on this website can help with some of these decisions. Others will require expert consultation. Any mention or image of commercial products within NIST web pages is for information only; it does not imply recommendation or endorsement by NIST. Questions about Mercury Thermometer Alternatives?